Dry lining is used to cover interior walls, avoiding the need to fully replaster and giving homeowners and businesses a blank canvass in which to decorate. Before dry lining, walls were covered with a wet sand and cement render or plaster. 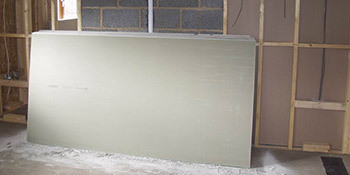 Now, plasterboard is stuck onto interior walls or fixed to timber or steel frames. With dry lining plasterboard you have the opportunity for a quick installation and there’s no drying out period. This puts it ahead of wet finishes and is stuck to walls with plaster and adhesive, ensuring it stays in place. Dry lining is a much lighter product than the wet counterpart, meaning that the finished construction will be lighter and less moisture will be introduced. With dry lining, you’ll be able to change things around far quicker. With plasterboard dry lining you’ll have the opportunity to provide greater insulation to your home. This will help to keep your property warmer and help to meet the demanding specifications of the Insulation Building Regulations. You can even ask specifically for insulating dry line plasterboard to be installed. Just like its insulation qualities, you’ll also be able to reduce noise pollution with dry lining plasterboard as opposed to wet finishes. On top of this you’ll have greater fire and moisture protection, which in turn will help reduce the risks of condensation. As one of the most common causes of property damage, it’s crucial to cut moisture. With plasterboard dry lining you’ll have the opportunity to have your property decorated quickly and easily without having to wait around for weeks as the wet finish dries. With a tonne of benefits including insulation, soundproofing, fire protection and easy decoration, why not find out how much you’ll save with expert quotes. Just complete our quick form below and receive up to four FREE quotes from local, vetted and reputable professionals in your area.